The truth is out there - and it starts with this X-Files Minimates 2-Pack. Mulder and Scully return to TV in a X-Files mini-series, and this Minimates 2-pack captures the pair in their current look! 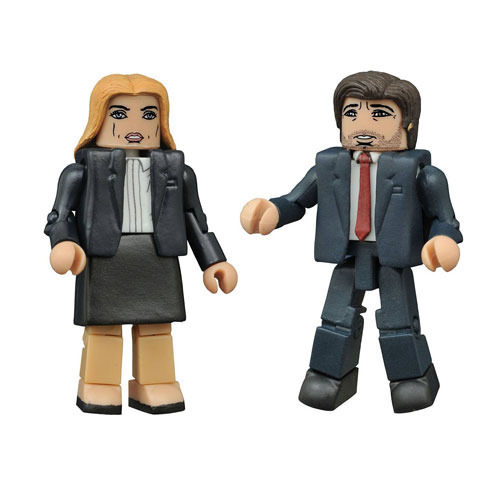 These Minimates mini-figures of FBI agents Fox Mulder and Dana Scully are based on their 2016 reunion show, and depict Mulder in his unshaven appearance, and Scully with her blonde hairstyle. Each mini-figure measures approximately 2-inches tall, with 14 points of articulation, and like all Minimates, their parts and accessories are fully interchangeable. Set includes weapons, badge hand and display bases, packaged in a full-color blister card. Ages 8 and up.